In our last post, we’ve introduced you to powerGate 2016 and the BOM transfer dialog. This time I’d like to disclose a little secret around the powerGate Server. powerGate is getting a lot of attention these days, and one of the common wishes is the ability to demonstrate powerGate live, running against an ERP system. Now, as there are so many ERP systems on the market, and almost none of you runs with an SAP or the like on his notebook, the question is, how to simulate an ERP system for test and demo purposes. We came up with powerGate ERP. 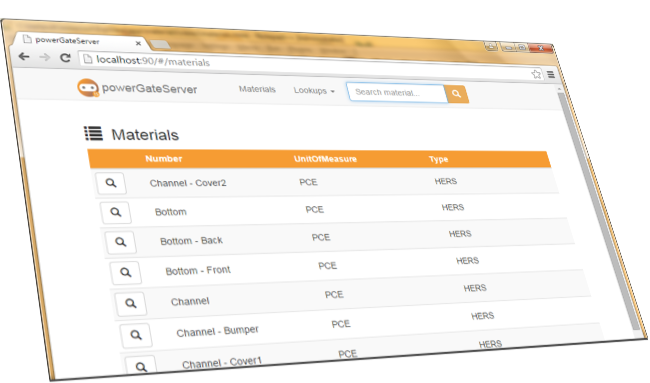 It’s a simplified ERP web page that allows you to display items and BOMs you’ve created with powerGate. This way, you can test powerGate right away, create items, BOMs, etc. and see the results in a nice web page that mimics an ERP system. By now you’ll ask where is the secret? Well, the powerGate Server provides the data to the Vault client in form of a web friendly REST/OData API. Yes, the powerGate Client and the powerGate Server communicate via REST with each other, therefore any REST capable application can talk to the powerGate Server. Now, in case of the powerGate Client, we developed simple PowerShell command-lets like Get-ERPObject, Add-ERPObject, Update-ERPObject, etc. in order to read and write data from and to the ERP system. Such command-lets are used within Data Standard dialogs for the communication between Vault and the ERP system. For more information, download and installation instructions, read the wiki. This entry was posted in powerGate, PowerShell. Bookmark the permalink.